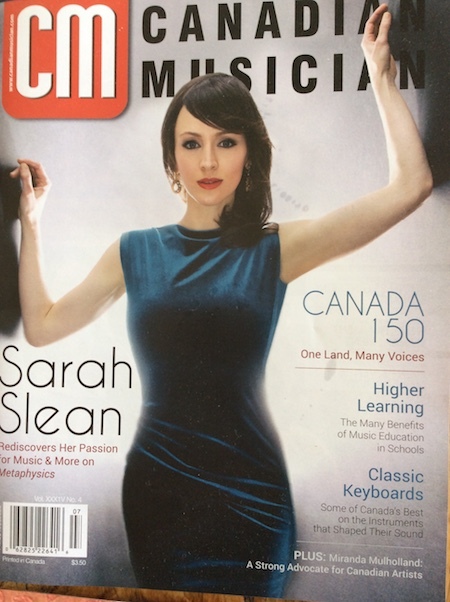 Just in time for back to school, Canadian Musician and its sister magazine Canadian Music Trade have reminded teachers, musicians and the public of the importance of music education. With a cover heading of “Higher Learning – The Many Benefits of Music Education in Schools” the article in Canadian Musician says that "When kids are involved in music, they are learning – and not just how to keep a beat. Everything from behavior to concentration can benefit from exposure to and involvement with music." It goes on to cite the research that supports what JPEC has always promoted with their Outreach Program. As JPEC director and head of the JPEC program, Sandy Thomas says : (JPEC’s) interactive workshops examine the various components of jazz, the roles of various instruments, the importance of improvisation, composition and more. One Toronto-based organization seeking to bridge the gap with its musical outreach program is JPEC, short for Jazz Performance and Education Centre, a not-for-profit, charitable arts organization dedicated to the preservation and continued development of jazz in Canada. JPEC’s Music in the School’s program is in its sixth year. Schools qualifying for the program are those in high needs or priority neighbourhoods. Costs are covered for two 45-minute interactive workshops lead by a variety of musicians. Feedback from teachers is uniformly positive. One teacher wrote: “The interactive, kinesthetic performance allowed all my students to take away information about the instruments and the culture.” Another wrote: "All of the students (were) still talking and writing about the program in their respective classrooms." 1. Help students create instruments and then play them: e.g., drums out of plastic containers, horns out of paper towel cardboard rolls, or any toy instrument they have at home. Don’t forget voices as an instrument. 2. Investigate organizations that have programs for children: everything from Tafelmusik Baroque Orchestra to the National Ballet have special programs. Some bring musicians to you at no cost to the school. 3. Check out your local community centre. Maybe together you can initiate a program for children’s music. And remember, it’s not just fun. It’s brain food. 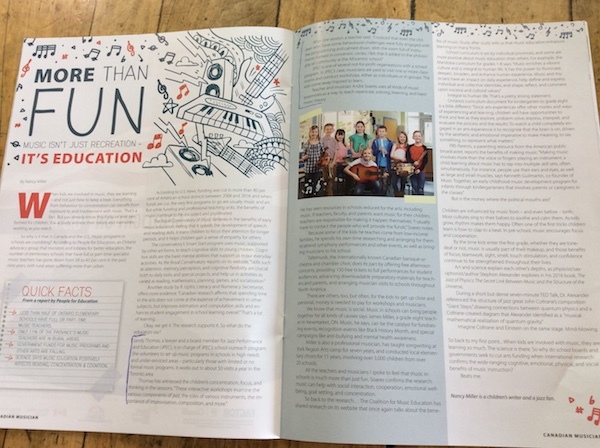 JPEC is highlighted in an article in Canadian Teacher Magazine saying music is brain food for kids. Recently, the Globe and Mail published the article, "Music Classes Taking a Beating in Ontario Schools". This was based on 2013 Annual Report published by the education advocacy group, People for Education. The full report is worth reading and is available on their website, www.peopleforeducation.ca. One particular quote from this report resonated: "When arts are treated simply as enrichment, they are particularly vulnerable to cuts in funding from the province or the school board". While this observation was made in the context of education in Ontario, it transcends provincial and national borders. We commonly hear that music programs are victims of cutbacks with the squeezing of education budgets. This is sometimes supported by the notion of implementing educational curriculum that "gets back to basics". In reality, the value of music education goes well beyond a nice add-on to child education and development, it is just as fundamental as the time honoured "3 R’s". There have been a wide range of scientific studies that speak to this. A CBC report in 2006 cited a McMaster University study on the effects of music in child learning development. Among the many positive effects, the study found particular changes in the attention systems of children who took music lessons, which affected their ability to pay attention to important things around them. "A child with a superior attention system will be able to apply that in different domains, so they'll be able to focus in on what's important in a verbal learning task, they'll be able to concentrate when figuring out a mathematical problem." Additionally, the process of learning a musical instrument and playing with others evolves a number of skills that are fundamentally necessary not only in their remaining academic years, but their future occupations. Playing music demands dedication, discipline, and teamwork. It requires commitment to practice and rehearsing to execute a musical performance. Music also requires students to approach problem solving in creative and imaginative ways, requiring both linear and non-linear thinking. Music does not have only one right answer. The act of analyzing music and the strategy of performance requires the same characteristics as those common to business leadership. This is brilliantly expounded in the book "Yes to the Mess: Surprising Leadership Lessons from Jazz Improvisation" by Frank J. Barrett, Professor of Management in the Graduate School of Business and Public Policy at the Naval Postgraduate School. A summary of his thesis is available on the CNN website, www.cnn.com/2013/02/21/opinion/route-to-top-jazz-business-success. Even recognizing the importance of maintaining music programs within the education system, it is equally necessary to draw support from any number of external resources. Music specialists can augment the academic programs through their ability to delve more deeply into various musical cultures, history, and performance. In working directly with schools, JPEC sponsors musical performances and discussions using highly credentialed musicians from the local community. This is a basic tenet of JPEC. Quite simply, better music education means better education.